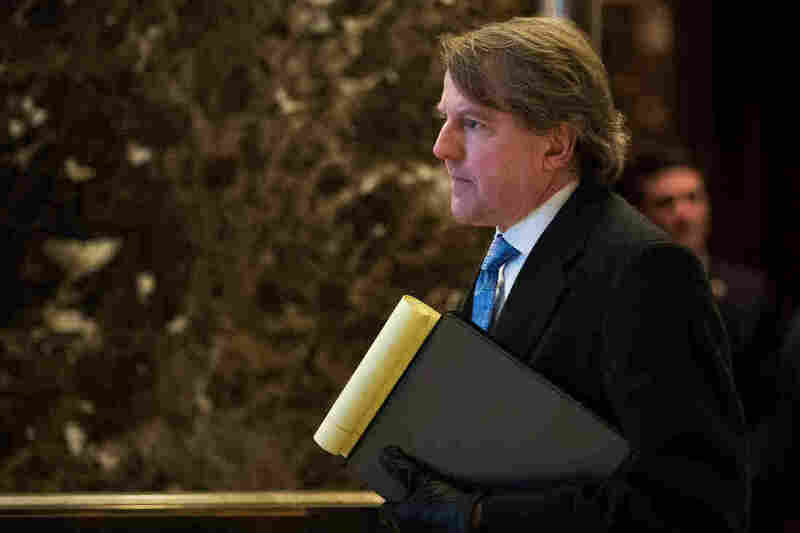 Top White House Lawyer Donald McGahn Sits At The Center Of Controversy Lawyers are dissecting the performance of White House counsel Donald McGahn — and the top lawyer at 1600 Pennsylvania Ave. is getting mixed reviews amid several Trump administration controversies. White House counsel Donald McGahn is in search of legal advice because of intensifying investigations into Russian interference in last year's presidential election and ties between Russians and the Trump campaign. Experts said it is natural that McGahn would seek out legal expertise; he served as the lawyer for President Trump's campaign, which has come under scrutiny from the FBI and Congress. This week, Trump himself reportedly enlisted New York lawyer Marc Kasowitz, a self-described "tough guy" corporate litigator, to help him with legal issues related to Russia. Several other figures inside and outside the White House have been lawyering up, expecting to be called as witnesses, even before the Justice Department named former FBI chief Robert Mueller to be special counsel for the agency's Russia probe last week. That announcement has focused attention all over again on McGahn and his performance as White House counsel — a high-wire act in the best of times and one that requires an understanding of the Constitution, the scope of executive branch power, national security threats and, especially, damage control. According to lawyers from both political parties, by those measures, McGahn is hanging on by a thread. First, there's the legal work product. They point out that the president's travel ban executive order, blocked by the courts after a chaotic rollout, had inconvenienced thousands of airline passengers, had to be rescinded and was overridden. A second order was blocked, too, after judges cited statements by Trump and his advisers that signaled that an animus against Muslims had motivated the ban. Those cases are still moving through the appeals courts. A separate executive order seeking to punish so-called sanctuary cities by withholding federal grant money has since been significantly narrowed by the Justice Department after judges and local politicians raised questions about its scope and legality. Jack Goldsmith, a Republican and a veteran of the George W. Bush administration, has written a series of tweets and posts detailing McGahn's shortcomings in the White House this year for the website Lawfare. "I was pretty hard on White House Counsel Donald McGahn in connection with the horrible roll-out of the Trump Executive Order on immigration, and his inability or disinclination to control the President's self-destructive attack on courts," Goldsmith wrote in February. To that list, Goldsmith has since added the vetting of former national security adviser Michael Flynn and McGahn's apparently glacial response to warnings from the Justice Department in January that Flynn had been "compromised" by contacts and undisclosed payments from the Russians. Sally Yates, the acting attorney general and Obama administration holdover who was fired by Trump after she refused to defend his travel ban, told Congress that she warned McGahn about Flynn but that he failed to take swift action. So, Yates said, she tried again — only to find that Flynn remained in his job longer than she did in hers. "McGahn is reportedly 'an iconoclast bent on shaking things up,' " wrote Goldsmith, who now teaches at Harvard Law School. "Unfortunately for the President, that is not an attractive quality in a White House Counsel, whose main job is to ensure that the President and the White House steer clear of legal and ethical and related political problems." Other lawyers, veterans of the Obama years, have expressed concern over contacts by the president and his chief of staff, Reince Priebus, with the FBI over the Russia probe and other sensitive topics. As a matter of course, those conversations are generally limited to a small number of people at the White House and the Justice Department, which guards its independence and tries to steer clear of politics in its law enforcement responsibilities. "It's important that the White House counsel police, for lack of a better word, the lines of communication between the White House and the Justice Department," warned Obama White House lawyer Kathryn Ruemmler, in an NPR story after last year's election. "Under President Obama, those communications were restricted." Now, those conversations will be picked over by Congress and even the special counsel, when it comes to what Trump told then-FBI Director James Comey in a series of meetings and chats this year before Comey was fired. Others are noticing signs of trouble, too. "Yo, Where's Don McGahn?" asked a headline in The American Lawyer. "Clean Up on Aisle Trump," concluded the left-leaning magazine Mother Jones. To be sure, five lawyers told NPR, it's not clear what kind of advice McGahn may be providing the president — or whether the president is listening to it. "Who knows?" one attorney said, adding that he is inclined to point the finger at the client as much as the lawyer. The barbs come as something of a surprise for McGahn, who made his name in Washington defending politicians accused of ethical foot faults and helping campaigns navigate a thicket of laws and rules governing finances and donations. The White House press office didn't respond to a request for comment from McGahn. But Reginald Brown, a prominent Republican lawyer who worked in the George W. Bush White House counsel's office, offered praise for McGahn's hiring, calling it "exceptionally strong." The counsel's office operates like a small law firm, filled with about two dozen lawyers. McGahn's picks include a dozen graduates of Yale, Harvard and Stanford; seven former Supreme Court clerks; and 15 lawyers who clerked for other top appeals court judges. Brown also took note of perhaps the Trump administration's most important legal accomplishment to date: the nomination and confirmation of Supreme Court Justice Neil Gorsuch. "Gorsuch was probably the best choice Trump could have possibly made for the Supreme Court, and the quick rollout and vetting seem to have been handled with great skill," Brown said. True enough, critics said, but they point out that much of the heavy lifting on the Supreme Court nominee was outsourced to Leonard Leo, the executive vice president of the conservative Federalist Society.